You can link your Micros 3700 POS with 7shifts to provide accurate sales forecasting when building schedules. This allows you to stay on budget and schedule within your labor target percentage. 7shifts will also show you in real-time your actual sales compared to your projected sales. Email support+micros@7shifts.com requesting the Micros3700 POS integration. Our support team will work with you to arrange the install. The Micros 3700 POS integration can be used on our 'Gourmet Plan' only. After a successful install, your account will be moved to the Gourmet Plan. * NOTE: for Micros 3700 POS integration, your account must be on the Gourmet plan. You can link your Micros 3700 POS with 7shifts to provide accurate sales forecasting when building schedules. This allows for more accurate scheduling to help you to stay on budget and within your labor target percentage. 7shifts will also show you in real-time what your actual sales are and alert you when you're making shift changes. The Actual Sales row will initially be empty until sales start rolling in. Once the sales numbers have been pulled in to 7shifts, they will appear under the specific day. Now when you go to build schedules for future weeks, 7shifts will automatically look at past historical sales and insert Sales Projections for you. You'll want to map your specific Roles between your POS and 7shifts to easily assign Roles when adding new employees from your POS. 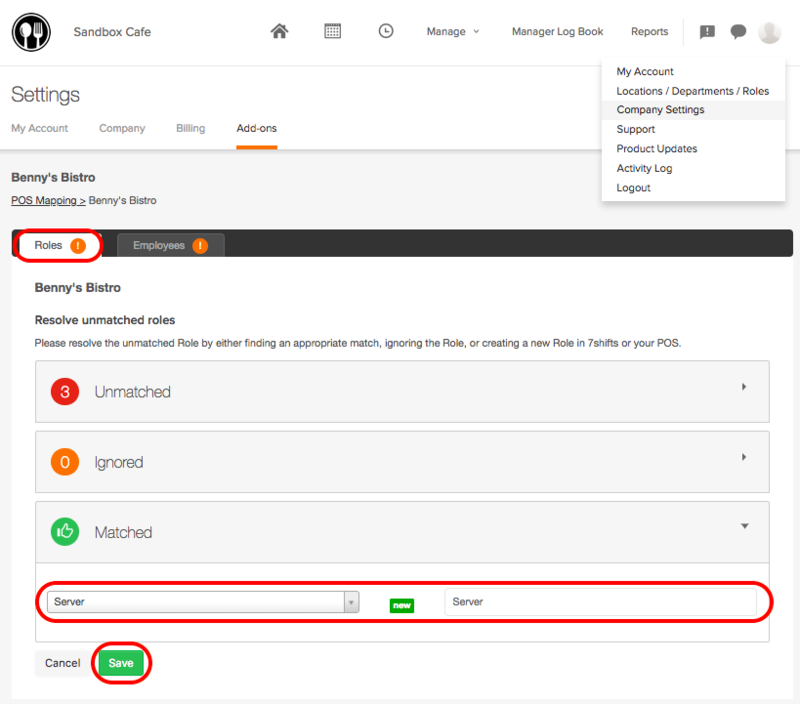 Hover over the profile icon in the top right, then select Company Settings > Add-ons > Third Party. From there select Micros 3700 > Specific Location > Map Roles and Employees > Roles. 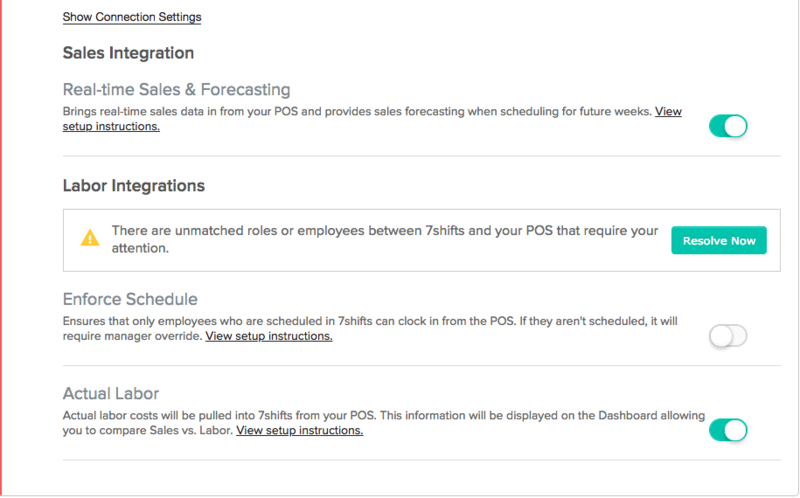 7shifts will automatically map any Roles that already exist between your POS and 7shifts. You'll find those under the 'Matched' heading. You'll simply need to click 'Save' to complete the mapping for those. If 7shifts was not able to auto-map the specific Roles, you'll need to either create the Role within 7shifts. You'll want to map your Employees between your POS and 7shifts to connect the Schedule Enforcement and Actual Labor integrations. From there select Micros 3700 > Specific Location > Map Roles and Employees > Employees. 7shifts will automatically map any Employees that already exist between your POS and 7shifts. You'll find those under the 'Matched' heading. You'll simply need to click 'Save' to complete the mapping for those. For unmatched employees, you can either match up, ignore, or create the employee. After clicking 'Save', it can take up to 3 hours to finish syncing. Moving forward, you can add your new employees to your POS or 7shifts. If there are any new employees needing to be matched, you will see a banner at the top of your screen notifying you to take action. With the Micros 3700 Actual Labor integration, your actual labor costs will be pulled into 7shifts. Once enabled, your actual labor data will be displayed on our Dashboard, allowing you to compare Sales vs Labor. To enable Micros 3700 Actual Labor, click the Micros logo. From there, click 'Settings' beside the Location(s) that you want to enable. Next, enable your Actual Labor at the bottom right corner of your screen. *Note: You'll see the Actual Labor numbers update on the Dashboard on the day you enabled Micros Actual Labor. Going forward, these numbers will be updated daily from your Micros terminal. Ensures that only employees who are scheduled in 7shifts can clock in from the POS. If they aren't scheduled, it will require a manager override. The install for this feature requires some specific permissions on your Micros3700 POS. Our support team will review these during the install process. 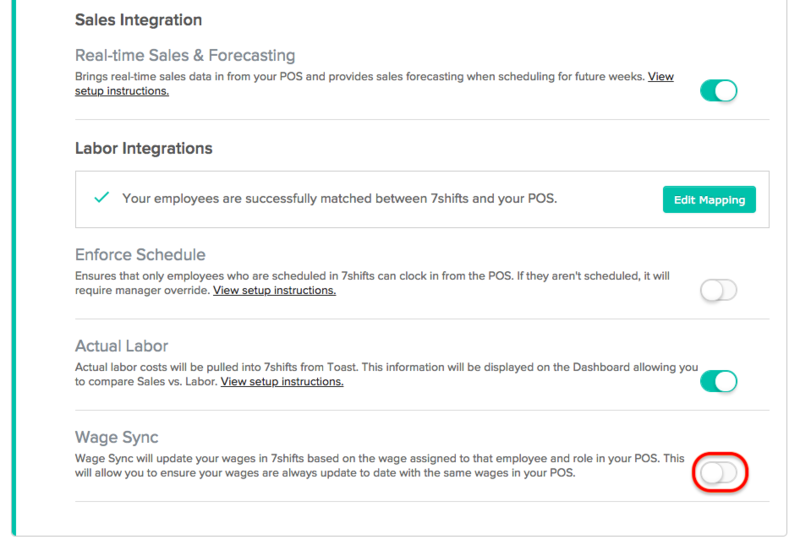 You can set your employees wages in 7shifts to sync with the wages from your POS. This will ensure that your wages within 7shifts are always up to date with the wage in your POS. Prior to syncing wages, you'll want to ensure that you have you have properly mapped your Roles. Hover over your profile picture > Company Settings > Add-ons > Third Party > Micros3700. Click 'Settings' beside the Location(s) that you want to enable. Click the slider button to enable your Wage Sync at the bottom right corner of your screen. In order to apply the Wage Sync feature, you'll need to enable Wage-Based Roles.